Honda is using the 2010 Super Bowl to launch the latest animated commercial introducing the Accord Crosstour. “Squirrel” airs during the fourth quarter, featuring an animated squirrel with an insatiable appetite for “squirreling away” all things cargo. 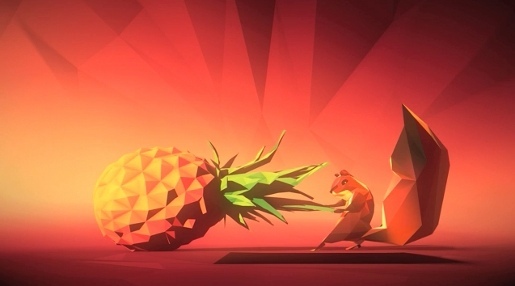 “Squirrel” is part of an integrated, multiplatform advertising campaign which includes three other animated commercials, “Instruments”, “Box” and “Snow Trip”, combining atypical, pronounced polygonal animation and rhythmic music. The “Squirrel” spot will also be featured on a takeover of the MSN home-page on Saturday February 6 through to Sunday February 7, the Fox Sports home page on Sunday February 7, and the YouTube masthead on Monday February 8. A squirrel moves its gear to the tune of “Funky Stuff” by Kool & The Gang, a jazz, R&B, funk, pop disco fusion band. Download the track from iTunes. Cargo, incognito. 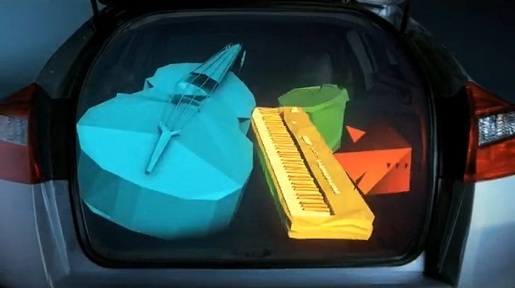 A jazz singer and quartet perform “Fever”, before having their instruments stashed in the back of a Honda Accord Crosstour. The song’s music and lyrics are credited to Eddie Cooley and “John Davenport” (a pseudonym for Otis Blackwell), and was first recorded as a rhythm and blues hit for Little Willie John. Peggy Lee made the track a pop standard on her album, All Aglow Again. Whitewater rafting, frisbee throwing, star gazing, all require a vehicle. “It fits, without fitting in”. Music is “Pata Pata”, performed by South African singer and civil rights activist Miriam Makeba (Mama Afrika), co-written with Jerry Ragovoy. Download the track from iTunes. The Crosstour spots are being programmed during high-profile, high-engagement network prime, sports and cable programming, including the championship game of the Bowl Championship Series on ABC, Super Bowl XLIV on CBS and the 2010 Winter Olympics on NBC. On Jan. 1, branded entertainment in the form of custom-produced vignettes kicked off with a 90-second vignette during the 2010 Bridgestone NHL Winter Classic on NBC. The vignettes continue through January and co-promote the all-new Accord Crosstour and the return of NBC’s Chuck. The story line of the vignettes began at the Winter Classic and follows a journey toward the Winter Olympics. To leverage the target’s heavy print readership, Accord Crosstour print appears in magazines across various categories, including the Sports Illustrated Swimsuit Edition, Men’s Health, Time, Forbes and The Economist. In-theater begins in February and outdoor will be featured in more than 20 key markets during the spring. Extending awareness of the Accord Crosstour online, unique placements included sponsored content that ran across various technology Web sites coinciding with the Consumer Electronics Show. Consumers can connect with the all-new Accord Crosstour at the following high-impact events, targeting upscale suburbanites in June 2010: Ribfest Chicago 2010, Safeway National Capitol BBQ in Washington, D.C., and the 36th Annual Sun ‘n Fun Fly-In in Lakeland, Florida. The Honda Crosstour campaign was developed at RPA by chief creative officer David Smith, creative director Pat Mendelson, copywriter Seth Prandini, art director Chuck Blackwell and executive producer Gary Paticoff. “The style of the work really comes back to the Crosstour itself. It’s a modern solution. It gives you a lot of storage, but it doesn’t look or drive like other things out there. We wanted the visual style of the advertising to reflect this. So right away, you know that something new is going on here,” said Pat Mendelson, SVP, creative director at RPA. VFX were produced at A52 by CG lead Max Ulichney, 3D artists Paulo de Almada, Ian Ruhfass, Christina Lee, Rick Glenn, Kevin Culhane, Joe Chiechi, Lead compositor Shahana Khan, Rotoscoping artist David Hochstadter, colorist Angus Wall, assistant producer Heather Johann, producer Sarah Haynes and executive producer Jennifer Sofio Hall. Music was licensed and arranged at HUM by creative director/arranger Alex Kemp, arranger Robert Lopez, executive creative director Jeff Koz, executive producer Debbi Landon and creative director, licensing Tricia Halloran.